This video talks about replacing an old aluminum frame window with a high efficient window. Larry Janesky from Dr. Energy Saver explains what a window energy efficiency label means. Like your home’s insulation and HVAC system, windows and exterior doors play an important role in home energy performance. But windows and doors get extra attention because they also need to look good. When the paint cracks or peels around a window frame or the weatherstripping comes loose around a door, these details detract from a home’s appearance. Dr. Energy Saver works with many of the most popular window and door manufacturers, and installs top-of-the-line, energy-efficient windows and doors across the country. Our energy technicians will help you identify the best products for your home. 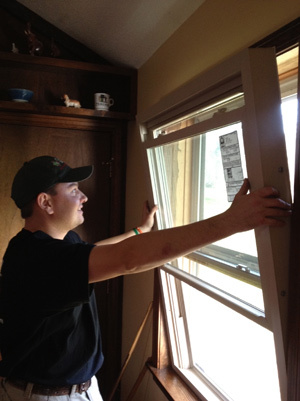 Replacement windows are custom-made to fit inside the existing window opening. Energy efficient. The National Fenestration Registration Council (NFRC) rates all major brands of windows for air leakage, U-value, and heat-blocking ability – three qualities that determine overall energy efficiency. These ratings are clearly displayed on the standard NFRC label attached to the window unit. Attractive. Different wood grain and color options (available from some manufacturers) provide you with more style choices. Durable and maintenance-free. Vinyl windows take the lead in this category, because they never need painting and they can’t be damaged by moisture. Easy to clean. Window frames that tilt inward enable you to clean the exterior-facing glass from inside the house. This makes window cleaning faster and safer. Available in a wide range of styles and sizes. Double hungs, bows, bays, casements, picture windows and more. Most houses have different types of windows. Make sure your contractor can satisfy your style and size requirements. Protected with a great warranty. Many manufacturers only warrant their windows for 10, 15 or 20 years. Sunrise Windows stands out in the crowd of window companies because of their transferable, full-value, lifetime warranty. Installed by experts. Make sure your windows are installed by skilled technicians who place a high value on good craftsmanship. Many of the details explained for windows above also apply to exterior doors. Older, solid-wood exterior doors are often replaced with doors that have fiberglass or steel skins and foam insulation cores. Fiberglass exterior doors are usually considered better for several reasons. They resist denting and heat transfer better than steel doors. Also, the fiberglass door skin can be textured and stained to resemble a solid wood door. Homeowners interested in improving comfort and energy efficiency often decide to replace older sliding glass doors with new, more efficient units. The vinyl frames used on new Sunrise sliding glass doors outperform wood and metal frames used on other “sliders” in terms of durability, energy efficiency and maintenance-free features. Many Dr. Energy Saver contractors specialize in window and door installation, and because of their understanding of home energy performance, they can help you pick windows and doors that will also save you money on your utilities. Find your local dealer and schedule an estimate today!